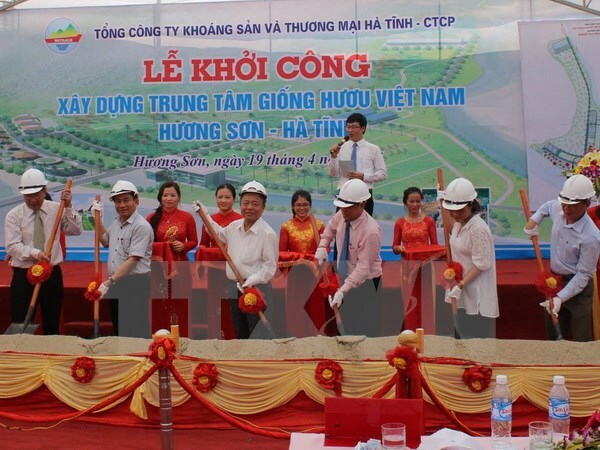 HA TINH (VNS) — The ground-breaking ceremony to build the largest deer breeding centre was held yesterday in the central province of Ha Tinh. The Viet Nam deer breeding centre, to be spread over nearly 50ha in Huong Son district, aims to raise 1,000 deer in the 2015-2016 first stage, with up to VND40 trillion (US$1.8 million) in investment. Between 5,000 and 10,000 deer are expected to be raised both at the centre and in local households by 2017. Ha Tinh People's Committee Deputy Chairman Le Dinh Son said the centre aimed to contribute to the breeding, conservation and development of the local Huon Son deer.